I’m In The June Issue Of All You Magazine! You are here: Home / Great Deals / I’m In The June Issue Of All You Magazine! Ok, so I HATE pics of myself! But, I had to show you this one. I am in the June issue of All You! I have lost almost 50 lbs now, this pic was taken a few months ago. But, I am excited! @JessieLeigh: Thanks so much I really am excited about my weight loss! Excited for you! I can’t wait to get my issue! That will be a keeper! Wow!! Dian, you look wonderful!!! I’m very happy for you. OMG I am sitting here lifting weights going I so hate Dian lol I love her but I sure hate her lol! You look amazing!!! Keep up the good work. I am inspired by you in so many ways. @Madalina: Oh, How Sweet!! Thanks you so very much for your kind words! OOh la la Mamma! You look good! Im proud of you. @April Labbee: lol! I’ve lost 20 more since then! So cool! You look great! Thanks! I have lost an additional almost 20 lbs since then, I am thrilled! .-= Dian´s last blog ..FREEbie: $20 In Similac Check/Coupons!! =-. You look awesome in pic. I’m sure you look even more awesome now. 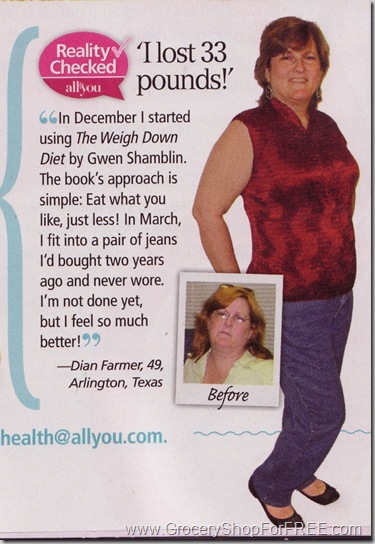 Good job losing all the pounds. Healthy living is something we all need to encourage in each other. Keep it up girl. @Jo Ann: Thanks so much! I totally agree! I wanna see and hear how anyone else is doing in their weight loss, too!\Thanks again! wow!! thats is awesome!! good job you look beautiful! now tell me your secret because i need to shed my baby pounds! (shes now 4months) I still want to go back to my normal size!! 🙁 Ever heard of Herbalife? Congratulations! That’s so awesome. You are doing really well and you look great. Keep up the good work. .-= Leslie´s last blog ..Cover Girl Shine Blast Review =-. @Leslie: Thanks so much I really appreciate it! I have lost another 20 now and can’t decide how much more I want to lose. So, I guess I’ll go until there’s no more juice left in my weight loss plan. As of now I am still losing and just continuing to stay on “Eat less” plan, it’s still working! .-= Peggy Gorman´s last blog ..Happy Mothers Day =-. @Peggy Gorman: Thanks, So much, I appreciate it!